In samenwerking met het Holland Festival presenteert Mister Motley in het voorjaar van 2019 een rubriek over landloosheid. 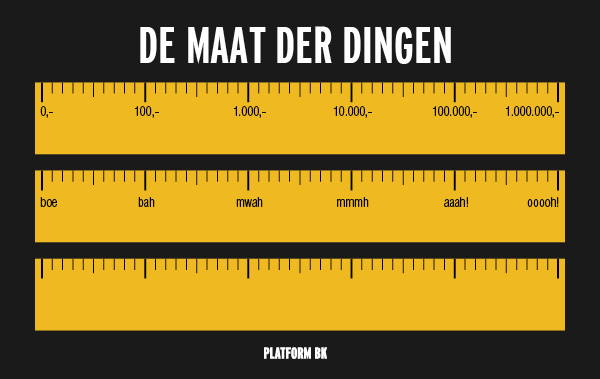 Vanaf april tot eind juni worden nieuwe en oude artikelen gepubliceerd van jonge kunstenaars, ervaren makers, uitzonderlijke denkers en kritische opiniemakers in het thema van landloosheid. Het artikel 'Manifesto for the (Young) Artist' van Lara Staal uit 2018 verschijnt opnieuw: een artikel over hoe je alleen vrij kunt zijn als je meedoet aan de set van regels in een land. During this episode I felt ashamed. Though I realized that had it been another conductor it could have been far worse. At least he arrived to Oss and is hopefully a bit nearer to his destination. He didn’t get a fine, nor was he handed over to the police. The conductor decided to - in a country where it is forbidden to not have identity papers – let the man go. But the situation highly disturbed me. We Dutch citizens with our approved train cards and digital train apps all passed the system. We follow the rules as is expected of us. We fit. This man for probably a variety of reasons can’t. And he was immediately recognized as a bug and treated as such. Because he was something that doesn’t ordinarily belong. And we, the fitting ones, were all observing the shameful scene that unfolded before our eyes without doing anything. We were witnesses of the system that did its job and we did nothing to change its path. Recently I was on a bus tour with We Are Here. 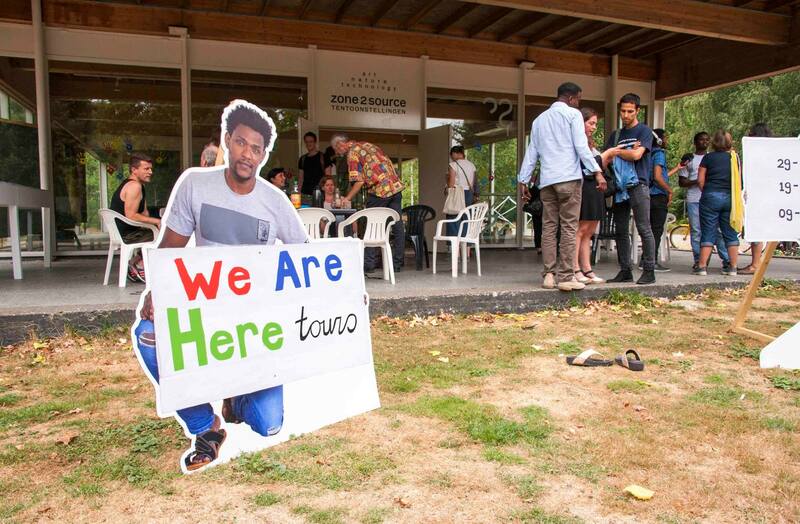 We Are Here is a refugee protest group that lives in the Netherlands for more then six years. They are people who don’t have identity papers but for different reasons cannot go back to their country of origin. They are too afraid and traumatized, they do not have identity papers, or their country of origin refuses them. The Dutch government does not provide these people with a solution and wordlessly but loudly asks them to disappear. Six years ago We Are Here decided to no longer hide and make this problem visible by starting a tent camp and later squatting different places. Today the problem stays unsolved. In the meantime, approximately one third of the group have gotten their papers, but the majority are still moving from squat to squat. I was present on the last one, two weeks ago. The three guides Sinan, Ahmed and Eric - all current or former members of We Are Here – narrated their former homes by telling the history of the buildings, the reactions of the owners and neighbours once it was squatted and sometimes personal anecdotes of events that happened in their lives while they lived there. When we stepped out of the bus to visit their former home, immediately someone came toward our guides and started shouting. It was a young man of colour, very agitated, looking only at our guides, as if we – the visitors of which most were Dutch and white - didn’t exist. The man shouted that it was illegal to be there, that this was private property and that the police have stated that nobody can access the area, all while we stood gathered on the public street. A friend of mine asked the man why he was only shouting at our guides, weren’t we also present? Another person said we had the right to be there as we were standing in a public area. The man said he was paid by Ymere to protect the empty housing block. I looked behind him and noticed two other guys sitting on plastic chairs. Some of the houses around us were still inhabited. People came by with their groceries, on their bikes, some people sat in their garden. There were no fences. Just these three guys sitting in front of one housing block that was empty since the beginning of June. I have seldom witnessed a more absurd and violent scene like this before, as if I could not believe we were really chased from a public street by three security guys. Although I do not believe art is autonomous – as it depends on institutions and funds with their own agenda’s and it is constantly in relation to human beings that are part of this society - it does operate within exceptions. The weakness of art – ‘whatever, it is only art’ – is also its strength. I have developed projects including putting Europe on Trial for the violation of human rights in light of the current refugee policies, and a performance in an official theatre with undocumented people who are not allowed to work. These projects were possible because ‘it was just theatre’. The legal framework has a tendency to make exceptions for art. And different from politics, we do not have to reach consensus. Within art we do not have to ask for permission. We can just do it and act. And of course it is frustrating that it often stays captured within the artistic realm, but that doesn’t mean it will not continue to haunt reality. Art can be a pre-enactment: an exercise for the future that is still unknown to us but that the project might help to unfold. Never grant a fund or an institution such power. Don’t forget the people that make those decisions are influenced by a lot of factors not visible to us. Consider the agenda of the organisation… Perhaps they were tired while reading the text… Maybe the person judging the application has a certain allergy that the project relates to… Maybe there were too many applications and a lot of good ones had to be rejected... Maybe there is a certain art trend that your project doesn’t touch upon… etcetera etcetera.